It is the first thing people ask when they hear you work in the space of helping people manage money.....'What should I invest in?'. The only appropriate answer to that question, I believe is along the lines of 'it depends on what your objective is'. This answer usually isn't what they expect, they expect a pitch for a certain share or investment in a German Shopping Centre Fund! The next question that follows will usually be....'How long should I invest for'? That is the question we are here to discuss. And for once I have had the time to write a short piece, so enjoy!! Firstly, and as always, we are chuffed that you have checked out our website & podcast. We are on a mission to help Ireland's normal folk to make the most of their financial lives and make Financial Planning accessible to all. We ask for your help to spread the word, share the article with the little icons at the bottom, check out the podcast, and in general just be a huge fan of our little site! Be delighted if you checked out our why. As always we're totally upfront when we say that we are openly biased on this little topic!.....We believe it is a simple concept that costs nothing and that no other tool, process or approach will have as significant an impact on your ability to be a consistently successful investor, as time. How Long Should I Invest For? If you are constrained to an investment shorter than 5 years and you wish to invest in anything like Equities or Property funds then you are absolutely gambling. Best of Luck! If you are in a position to invest for between 5-15 years then you are in reasonably positive shape for making a success of it, not quite a thoroughbred of investment but pretty close! If you are open to and indeed fully committed to investing, and leaving it invested for 20 years or more then you are, if over 100 years of history is anything to go by, as close to a bookies 'cert' as is statistically possible! What Does History Tell Us? Well interestingly enough you will see from below chart that on any given day the great companies of the USA (The S&P 500) are a coin-toss as to whether they will be up or down. It is this fluctuation that all those media articles, blog posts & Bloomberg-esque TV programmes feed on on a daily basis. But sure what possible difference does that make to the a 20 year investment plan? None. If you invest for any 12 month period you are more likely to end up than down. 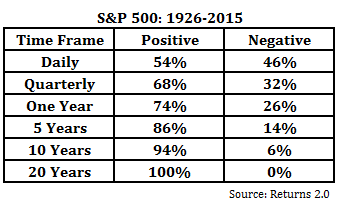 However if you invest over a 15 year period you would expect to experience a negative return once in every 500 rolling periods. The return would be positive 499 times and negative once! Over a 20 year period, it has not had a single 20 year rolling period (with a new period starting every month) there has never been a single period where the return has been negative. Speaking of 20 year periods, the worst 20 year return was 54%, however the worst 30 year return was 854%! We can deny it, dissect it, counter it and challenge it all day long, however the fact of the matter is that these are facts, and facts we don't often hear. My guess is that it is because there are lots of advisors selling products, with no awareness whatsoever of the actual market and historical facts. Where Do People Go Wrong With Investment Durations? It is a natural instinct to keep a hold of accessible cash, quite right. Indeed it'd be tantamount to madness to invest money into a similar asset as above without having a 'stash' that they could access for short-term needs or emergencies. Outside of that however it is tantamount to madness to not preserve the purchasing power of your money and to leave it on Bonds or Deposit for the long term irrespective, of your age. One of the core problems I see is that many investment funds accessible to Irish investors have recommended or indeed minimum time-frames. These are usually 5 to 7 years, and set as a result of product constraints or need to extract enough fees to cover the cost of selling that product to the investor! Unfortunately this timeframe can now become the target, to leave it there for the 5 years and then take it out. No No No! If you are indeed entering the investment with a plan, with clarity on the return you want to achieve and the outcome you are aiming for, please don't have 5 years as your target, give yourself a much higher probability of success and 'go long'. If you did find this useful please share, love it to bits and send me an email saying why...if you thought it was rubbish please send me an email and tell me why!